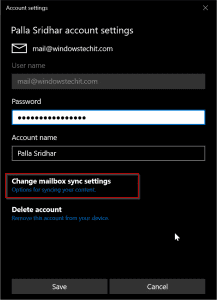 How to Configure Different POP3 Mail Accounts in Windows 10 Mail? If you have used Windows phone you are familiar with Microsoft’s Office Mobile productivity suite. The free version of Outlook Mail on Windows 10 mobile phone has come as plain Mail app on Windows 10 PCs. The main advantage is the Mail app interface looks very sleek. It also takes less time to load. With lot of settings the Outlook desktop app creates a bigger learning curve. But the use of Mail app is so intuitive that you can just start using it as a Google or Apple app. 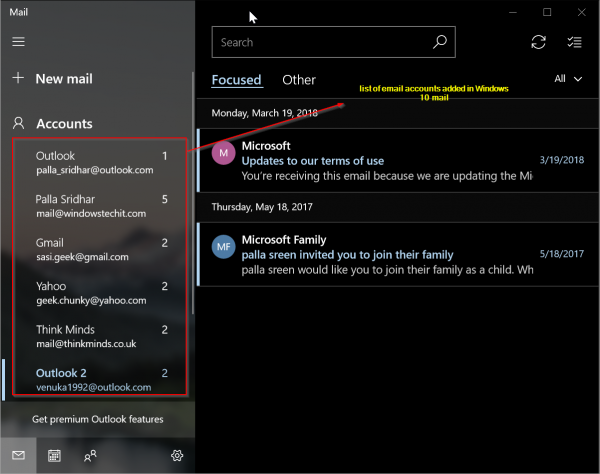 You can check your mails using the Mail app of Windows 10. 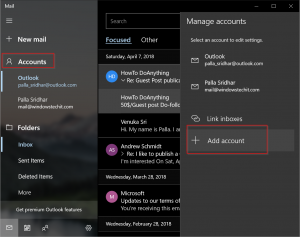 For this you first need to add your mail account, just you do in Outlook. But this is very less complicated in Mail, compared to Outlook. Sometimes, you need to manually fill many fields to add an email account. You can use the Active Directory services also to create an Exchange account in Mail. This is useful in a corporate scenario where Office 365 is used.. Instead of logging into your office website and checking mail, it is much easy to see in Mail. Also your personal and office mail can be seen on the same screen. The email setup for different services is almost the same. But for domain email, you need have your pop3 port settings ready before you add it. 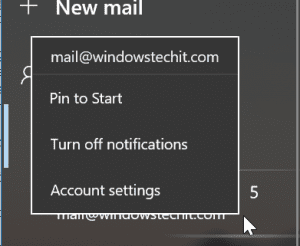 You can also change account settings in Mail, by just clicking the mail id. You need not download Mail app. It comes pre-installed with Windows 10. The Exchange account is also used in educational institutes. For .edu domains generally provide AD services to their students. Also corporates with .org can do the same. 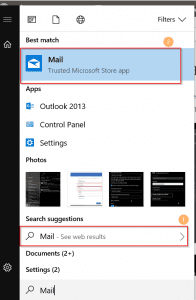 There are many ways to access your Store Mail app in Windows 10. You can use Cortana or type in search. Press the Win Key and type “Mail“. Sometimes after Creators or 1803 update, it is pinned to the Taskbar. Open the Mail Store App. On the left hand side, you will find Accounts. When you click it, two other windows will slide-out. On the last screen, you will find “Add Account“. Then another Screen with a list of Email services that can be added to Mail are available. 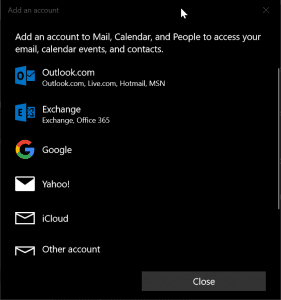 The list is like – Outlook.com (Outlook.com, Live.com, Hotmail, MSN), Exchange (Exchange, Office 365), Google , Yahoo! , iCloud , Other account (POP, IMAP) , Advanced setup. You can select the necessary one. Before you add this type of account, keep the following information in hand. 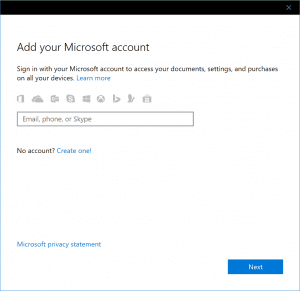 Sign up for a Microsoft Account with a Outlook.com or Hotmail account. Credential for your AD (Active Directory) – username and password. The username is generally your exchange email id. (text before the @). Make sure your email is registered on the Exchange organization. Then follow the common procedure to click accounts and find your service account. The Exchange can also have Office 365 installed. So you can add your exchange account by selecting Outlook from the services provided. The following details have to be entered. The domain and server field information is to be obtained from your computer administrator. Sometimes, the PC support team does all this or provides the info in a corporate office scenario. This is more easy then adding Exchange account in Mail. Select the Google item in list of services available in the common procedure. Give the credentials like username, password. Sometimes verification of mail account is asked. 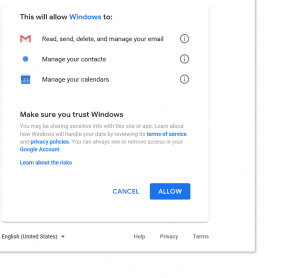 The permissions Mail app has access when Gmail account is added are shown. Just click continue and your account is setup. The easy thing about this set up is you need not give any POP3 settings. But you need to provided access to it in your Gmail settings. Mail app will automatically take all the required information other than the username and password. For some reason, if Gmail account is not created, you have to give the POP3 mail settings like Inbound, Outbound server names etc. It is typically of a domain email setup. But I didn’t face any problem during installation. It automatically took all the settings and set it up. This is typically like the Gmail account set up. 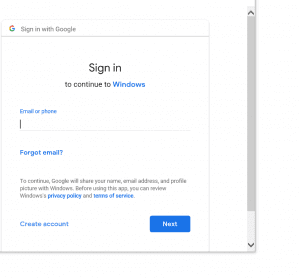 You just need to provide the username, password credentials to the Mail app. When you click the item in Accounts, it will automatically connect to the Yahoo! mail service. Then a pop-up window will open, where you have to provide the necessary details. 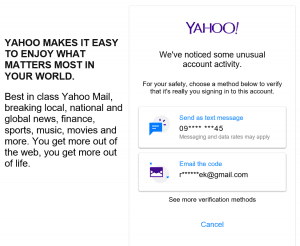 Just like Gmail, sometimes, you need to verify your Yahoo! mail account and accept the permissions Mail app has access. 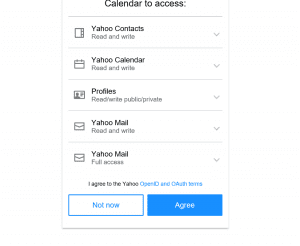 Sometimes, Mail app is denied access to add the Yahoo! mail account creation. This is a security feature problem in Yahoo. For some reason, Yahoo! think Mail is a less secure app. So it does not provide access directly. 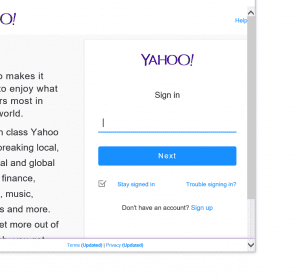 So you have to open Yahoo! mail account in browser and go to its Profile settings and give access to less secure apps. 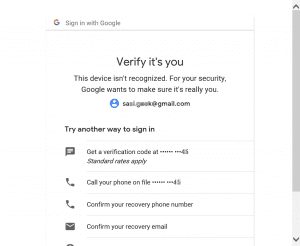 Otherwise, you can go for 2-step verification. This procedure is also similar to Gmail and Yahoo! accounts. You just have to give user credentials and all the other settings are automatically taken care of. Sometimes this account is also called the Microsoft account. This is also called the Internet email account in Windows 10 Mail. For example, if you have a website or blog, you have an email account associated with that domain. It will end something like @example.com etc. For this kind of accounts, you need to give further information like server settings. But the ease is that, it doesn’t ask for any port settings unlike Outlook. Just be ready with the POP3 settings before you enter. These are available with your website hosting service. A typical picture will look like the below. All of it is not required. The following information has to be given. Password – password for the above account. You need not give any cPanel or server credentials here. Just the email account password. Account Name – Anything is ok. Send your message using this name – The name, the sender sees. Incoming email server – this is something like mail.example.com for Non-SSL POP3 settings. For secure it is like example.com. 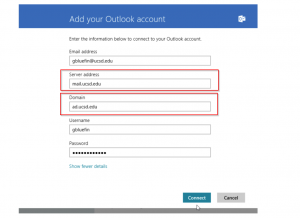 Account type – Select POP3 or IMAP4. Outgoing (SMTP) email server – this is same like the Incoming email server setting. These details are available with your host. The below options are also asked in continuation. You just need to enable or disable them. The last two are only if you want to use SSL for mail account access. Personally I had problem using the last two options in Outlook also. So I generally use the non-SSL settings, if the other one doesn’t work. Sometimes you need to make some amend to your existing account settings. For that, you just need to click the account name on the left hand side and select Account settings. 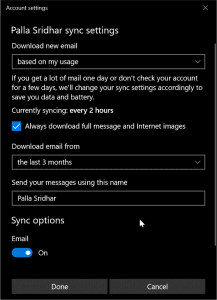 Here you can also change the time period of the amount of mail to download. You can also select whether full message and internet images are required to download or not. This is for security purpose.